Something a farmer does not want to see: the floating discs in the frost-free trough below the upper part of the trough. This indicates the float valve is frozen shut and not refilling the trough. A frozen livestock water trough is a nightmare for farmers. Thousands of “frost-free” watering troughs have been installed as an alternative to allowing livestock access to the streams and rivers. Livestock farmers have been excluding livestock from streams and rivers for decades. It’s one of the most effective practices for improving water quality in our streams and rivers. It’s one of many reasons the Chesapeake Clean Water Blueprint is working for a restored Bay. 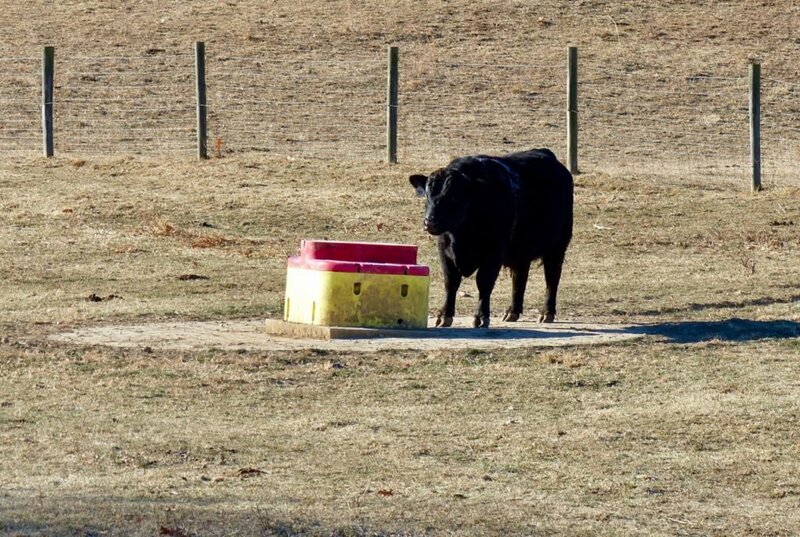 Many farmers have installed “frost-free” waterers for their livestock. These watering facilities require no electricity to keep them from freezing because they use heat from the Earth to keep them warm. No alternative watering system for livestock is maintenance free. And when we get sub-zero temperatures for several days these waterers can freeze up. Yikes! This is cold! Livestock farmers must check to be sure their animals have water. This past month we had three weeks of overnight, single-digit temperatures. Several of the “frost-free” watering troughs we have for our cattle froze up and several did not. Over the course of my career with USDA, I have helped farmers install several thousand livestock watering troughs. 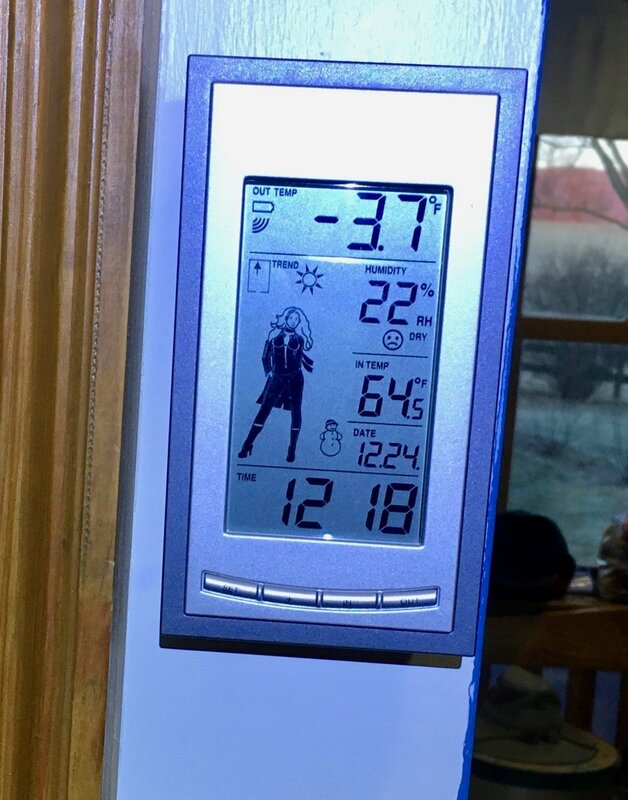 In this post, I’ll share what works in sub-zero temperatures and what does not. This trough in our bull field has never frozen, even when we have weeks of overnight, single-digit temperatures. It has never frozen because it was installed properly and is in constant use. Livestock watering troughs freeze up for several reasons. The main ones I’ve experienced are improper installation and lack of use. Frost-free or energy-free troughs such as Mirafount, Richie and Jug Waterers must be installed by the manufacturer’s instructions. Experimentation and cutting corners during construction will lead to a frozen trough and much consternation. We discovered in the worst of conditions on our farm, several troughs that were not installed correctly. One trough did not have the gasket installed between the top and bottom of the trough. Another did not have any insulation around the water pipe. Other reasons for a frozen trough include water pipes not buried deep enough below the frost line or the pressure switch not protected from low temperatures. Once we corrected contractor flaws and had an adequate number of cattle drinking from them, they never froze up. Frost-free watering troughs depend on heat from the Earth to keep the water in the trough from freezing. All manufacturers have a minimum diameter and length of “heat” tube necessary to keep it from freezing based on how cold it gets where they are installed. 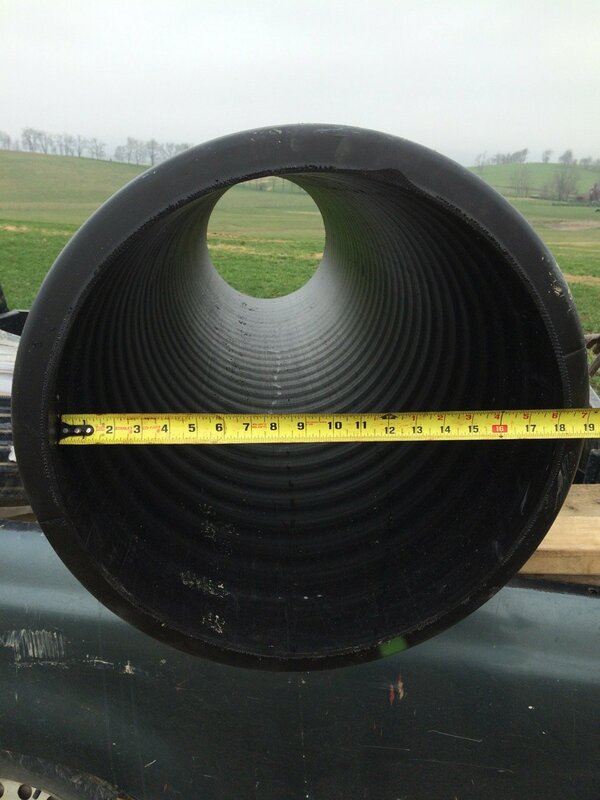 In Swoope, Virginia, one manufacturer recommends a 12-inch diameter pipe that goes down into the Earth one foot below the frost line. This is not adequate in my opinion. We had a contractor “experiment” with one of Mother-in-law’s frost free troughs. They used an 8-inch heat tube instead of a 12-inch. This trough froze up every day we had temperatures in the single digits. 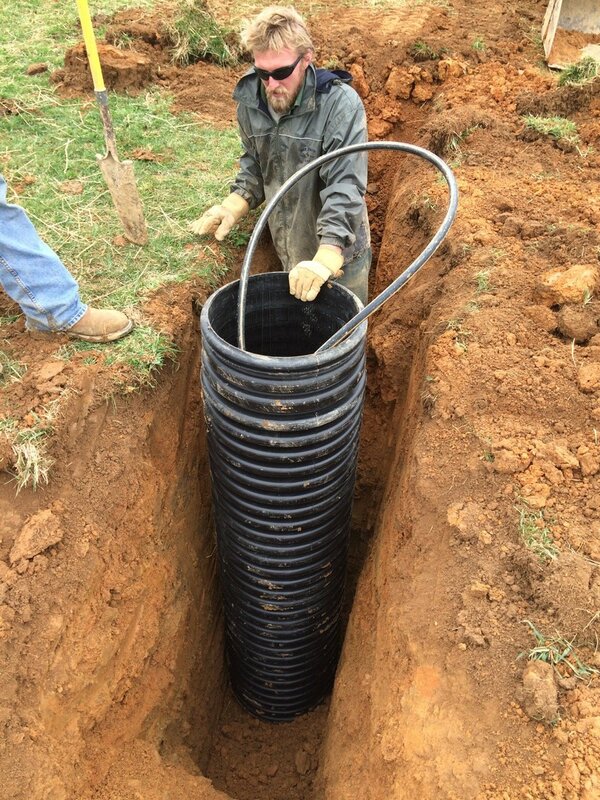 An eight-inch vertical heat tube for frost-free troughs is inadequate in Swoope, Virgina. A trough with this small of a heat tube will freeze. We replaced the heat tubes under two of our troughs with an 18-inch, five feet deep, double-walled corrugated plastic pipe. We replaced two, ill-constructed frost-free waterers with 18-inch, double-walled, corrugated plastic pipes that were at least five-feet long. 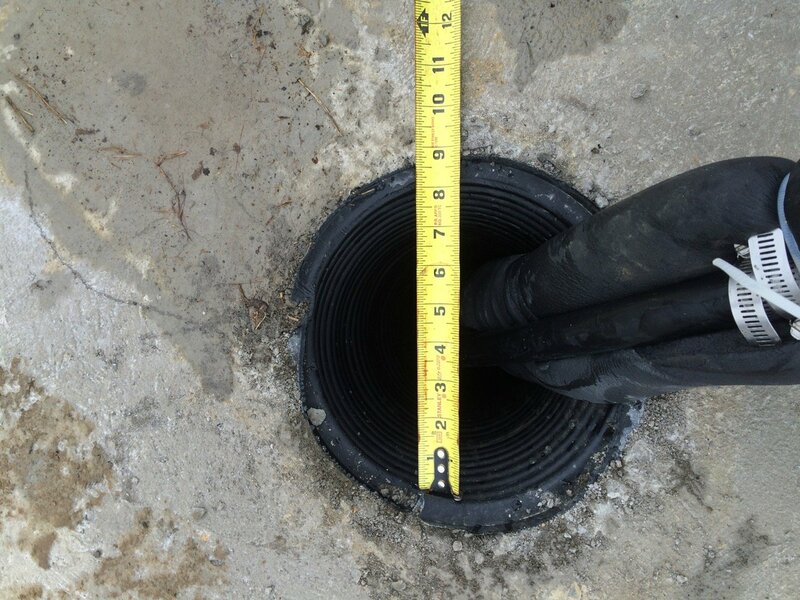 An 18-inch diameter, seven feet long vertical heat tube for the frost-free trough behind the house. Here is an excellent website that goes into great detail on how to install an alternative watering system for livestock. It is published by NRCS by my friend Jim Tate. We have a couple of frost-free troughs that were not being used during the long, cold spell. These troughs froze solid but it did not hurt them. They thawed out and were just fine. In those fields where we had livestock using the frost-free toughs and where the troughs were installed correctly, they did not freeze up. To keep troughs from freezing up there must be livestock using them. When water is withdrawn from the trough the float valve opens which brings in fresh water. This new water is WARM and will help keep the tough from freezing. 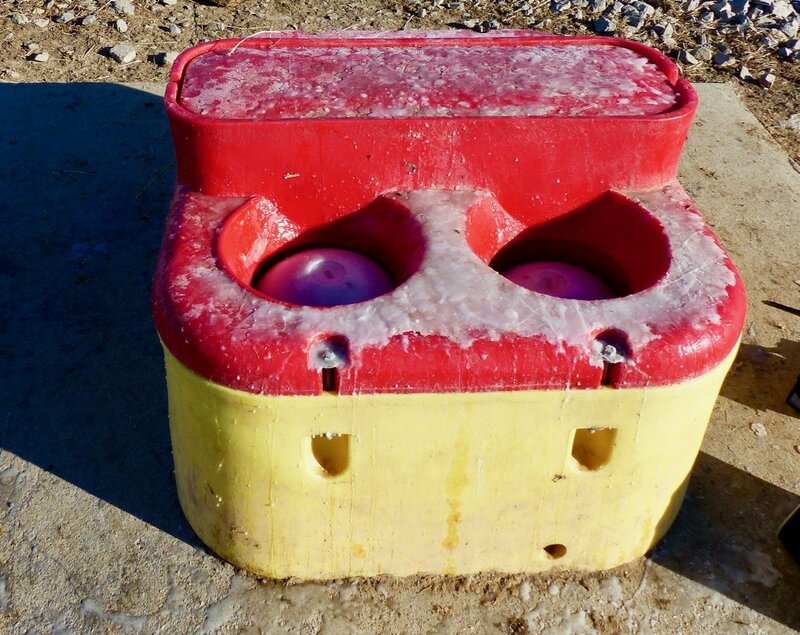 The most common freeze up with frost-free troughs happens when the balls or discs freeze to the upper part of the trough. We simply punch them down with our fist or use a rubber mallet to break them loose. Pour a small amount of vegetable oil over each disc or put a coating of vaseline around the edge where the disc meets the upper edge of the trough to prevent freezing. The second most common freeze up is the float valve inside the trough. We have a couple of troughs that are installed correctly but still freeze up when we have a week of single digit cold weather. These troughs are thawed out every time by heating up the valve leading to the float within the tough. The lid to the valve will have to be removed to reach the valve. The lid will most likely be frozen. We use a large screwdriver as a lever to pry the lid off. 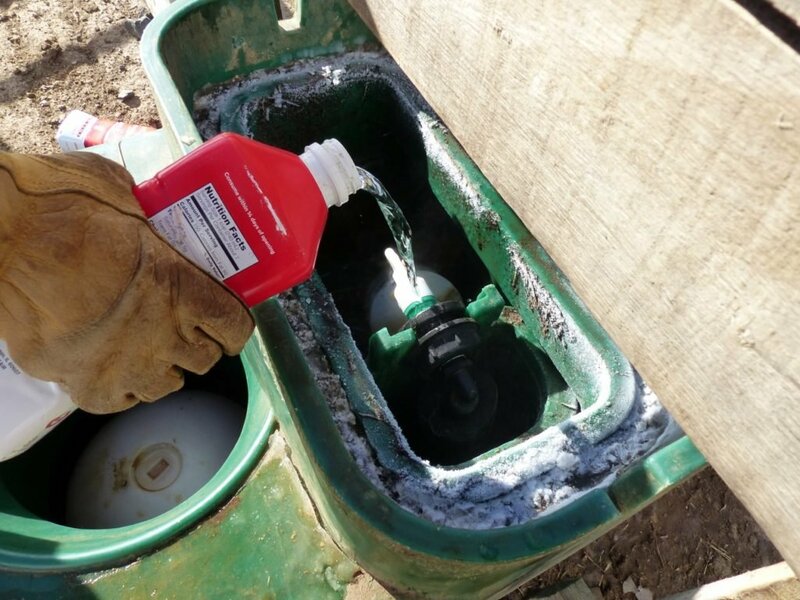 Pouring hot water on the float valve can thaw it out in a few minutes. We take a gallon of hot water with us to thaw out the valve within the trough. Once the lid is off we simply pour some hot water over the valve and within a couple of minutes, fresh water will begin to flow. We’ve used a hot air gun and a generator to do the same thing. 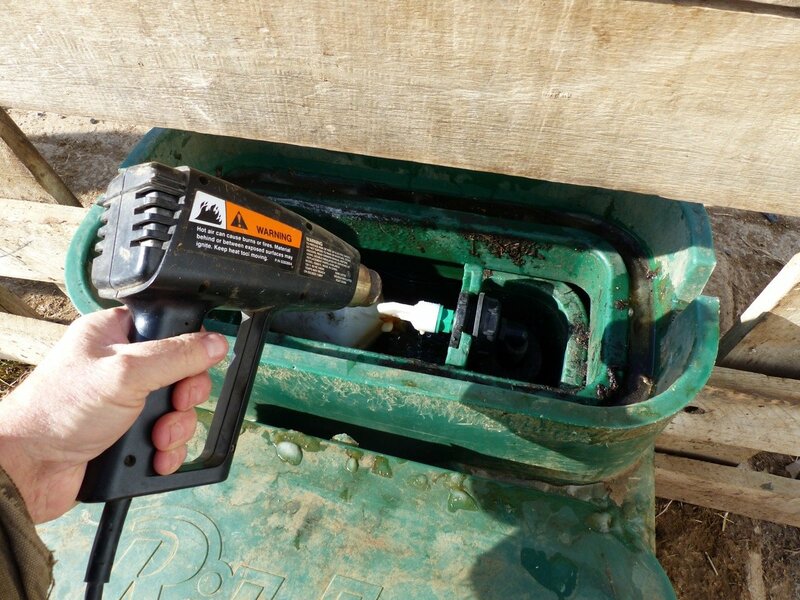 Using a heat gun can thaw out the float valve inside the frost-free trough. Be careful not to melt the plastic. 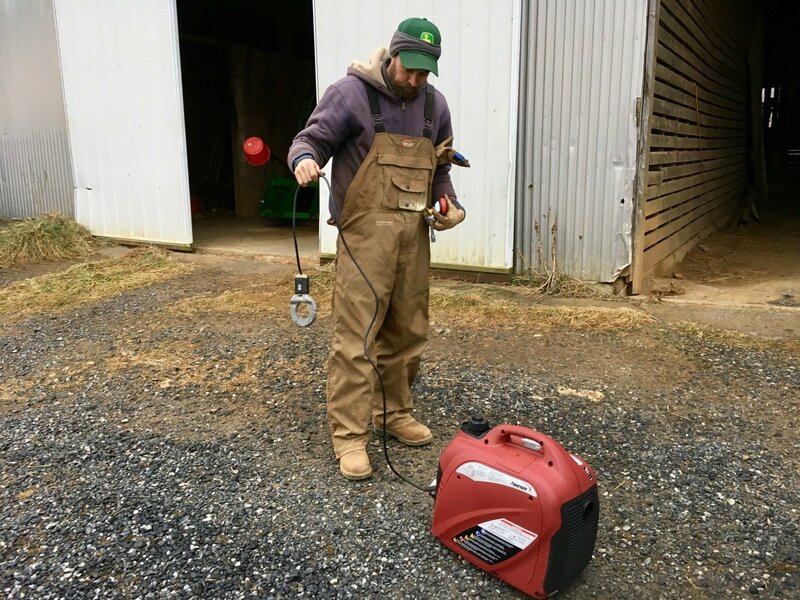 In the worst of cases, we have used a heating device connected to electricity either by a generator or extension cord lowered into the trough overnight. Neighbor Scott Miller, a cattle farmer, and songwriter with an immersion heater and a “baby” generator. Many farmers are doing their part to help clean up our streams and rivers by excluding their livestock. Non-farmers need to understand that alternative water systems are not maintenance free. Animals must have water to survive and sub-zero weather is challenging for farmers and livestock. The post Frozen Water in the Livestock Trough appeared first on Getting More on the Ground.